Donna Brazile, the interim chair of the Democratic National Committee, began providing town hall and debate questions to the Clinton campaign earlier than previously known, emails released by WikiLeaks on Monday show. The emails were hacked from Podesta’s Gmail account. Do You Think Donna Brazile Rigged The Town Hall Because She Thought Hillary Clinton Was Not Intelligent Enough To Answer Unprepared Questions? She has since said that the email may have been doctored by Russian hackers. She also complained that she is being “persecuted” over the matter. In the March 12 exchange, Brazile mentions Martin by name and offers to provide more than just the one town hall question that she is known to have shared with the campaign. The question she provided to Palmieri matched verbatim a question that an exonerated death row inmate asked Clinton the next night. CNN and host Jake Tapper have strongly denied sharing that question or any other with Brazile or anyone else. But an email released on Monday casts new doubt on the network’s claims that it never shares questions with outsiders. On March 5, Brazile tipped the Clinton team off to a question that was to be asked the next day at a debate that was hosted by CNN’s Don Lemon and Anderson Cooper. “One of the questions directed to HRC tomorrow is from a woman with a rash,” Brazile wrote to Podesta and Palmieri. A transcript of the debate shows that a woman named Lee-Anne Walters did ask the question of both Clinton and Sanders. Brazile, who claimed during the Democratic primaries that she was neutral, has defended herself during the email controversy by claiming that she was in regular communication with all Democratic candidates. But there has been no evidence produced so far that she shared debate and town hall questions with Sanders. Neither Brazile nor the DNC returned requests for comment. Update: CNN slammed Brazile in a statement while denying that the network leaked any information. “CNN never gave Brazile access to any questions, prep material, attendee list, background information or meetings in advance of a town hall or debate,” Lauren Pratapas, a spokeswoman for the network, told TheDC. She said that CNN accepted Brazile’s official resignation on Oct. 14. The longtime Democratic consultant’s deal was suspended in July when she became interim head of the DNC. Questions still remain about how Brazile obtained the question in advance of the debate. TheDC is told that a CNN employee spotted Brazile talking with a Flint resident at a community event on March 5, the day before the debate. The woman allegedly mentioned to Brazile that she had a rash and that she and her children suffered from lead poisoning. 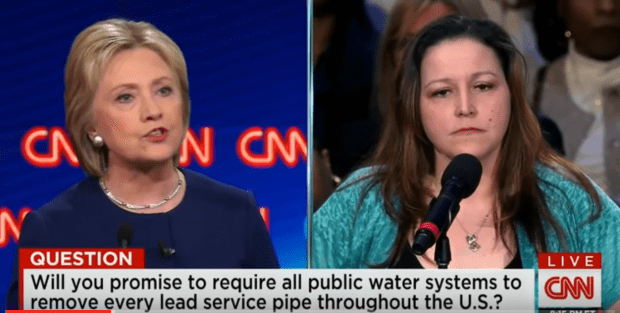 It is still unclear whether that woman was Lee-Anne Walters and how Brazile would have known that she would appear at the debate and be asked to pose a question to Clinton and Sanders. Brazile commented on the scandal on Twitter. She also referred reporters to comments she made on Oct. 11, after her leak to the Clinton campaign was first revealed. She denied leaking questions to any candidate in that statement.